Join us Thursday, May 2 at Richard Boyd Art Gallery for the opening of an annual group exhibition of original oil paintings created en plein air and in studio settings depicting a variety of scenes across multiple genres. 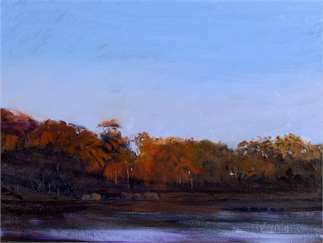 ‘Paintings in Oil’ is comprised of a selection of works by artists’ Patricia Chandler – landscapes, abstracts and still life; Carrin Culotta – landscapes; Kevin Daley – landscapes; Felicity Sidwell – plein air landscapes; Jen Pagnini – landscapes and abstracts; Roy Perkinson – landscapes and still life; and Wilson Stewart - landscapes. Although, each artist has their own style and approach to using the medium they are joined by a passion – painting with oils. The exhibit is on view free of charge between the hours of 10:00 a.m. and 5:00 p.m. daily through May 29, 2019. Richard Boyd Art Gallery is located on Peaks Island in Portland, Maine at the corner of Island Avenue and Epps Street. For more information about the exhibit contact the gallery by phone at (207)-712-1097, via email at info@richardboydartgallery.com or visit the gallery’s website at www.richardboydartgallery.com . Hope you’ll like us on Facebook at www.facebook.com/RichardBoydArtGallery and follow us on Instagram #richardboydartgallery. Copyright© 2019 Richard Boyd Art Gallery All Rights Reserved.